From 1929 to 1947 and other memories. 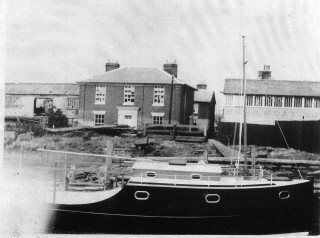 Marion, newly completed, outside Husk’s boat building sheds. These sheds were still there when James W. Cook closed and were finally demolished to make way for the Cook’s Yard housing development. The first visitor and customer that I remember hearing about was a Mr Gibbs. My parents went for short cruises with him in the 1920s. They may have used a small cruiser called ‘The Marion’ as there are a few b/w photos of them still extant. They visited the Norfolk Broads and the local rivers. Mr Gibbs or ‘Gibbo’ as he was known, gave me a doll’s pram and I was also given a large doll’s house by a customer, which my cousin also remembers, to this day! The ‘Margaret Mary III’, built in 1930, was one of the biggest cruisers that James Husk built. She was ordered by Mr George. Morris, of Colchester. My father bought mahogany and teak of first class quality, for constructing boats, and the finish of the vessels that were turned out was beautiful. It was said that if you visited the Works on Monday morning, and stubbed your toe on a piece of timber, you would be sailing your boat on Friday night. (This quote was told me by Peter Green of Wivenhoe). The staff of the works were all trained men, brought up from the age of 12, as apprentices, (children left school at that age, or later in the century, 14,) and were taught by skilled ship-wrights, and they all took great pride in their work. The finish that they achieved on the paintwork, the varnish and other surfaces was exemplary. There were carpenters, joiners, painters, riveters, sail makers, polishers and in latter years, welders, as well as men who could varnish wood, which are all skills, needing years of practise to achieve a high standard of finish. Copper rivets were used to construct all the dinghies. The works’ foreman was Mr Stanley Cook who once worked with my mother, when my father was in London, to send a quotation to a customer. They did the quote for c.15 small dinghies for one of the boating ponds which was accepted. My mother occasionally helped with typing letters, and with the accounts, as well. Before she married, she had worked for Ransomes and Rapiers in Victoria Street, London. 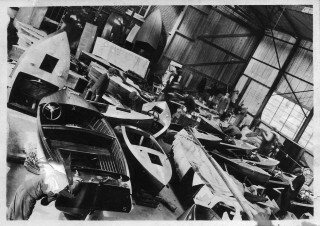 The big new shed was rebuilt and, as is evident from this picture, soon became filled with boats being built and repaired. Apprentices signed on and they worked for five or seven years, before they were qualified. During working hours, they were often teased by their elders, and they were sent to the stores to ask for ‘A long weight’- and they had a long wait,- or for ‘a left handed screwdriver’ or for ‘a bucket of cold steam!’. It taught them to think and to develop common sense. Also there was my father, who was a member of the Institute of Naval Architects. He was an engineer and could work with many materials. During the first World War, he was an Engineer Lieutenant in the Merchant Navy. He served on a Hospital Ship. He designed many or all of the vessels that were built, when he inherited the yard. Designs were printed as ‘Blueprints,’ and were displayed flat on a large desk top. Father had a set of Curves, delicate instruments of wood, rather like curved rules. These were used for designing. 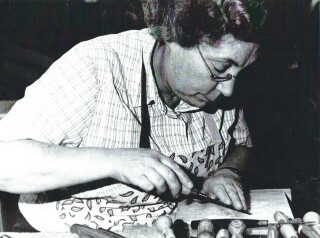 Tools were hand made as well as bought, and often people made individual equipment to do specific jobs. My grandfather is said to have invented ‘Sister hooks’ and also the ‘Polka’ stern. A design used for the first time on the ship named ‘Polka’. A new Husk’s cabin cruiser in front of James Husk’s old house. This is typical of the more or less standard cabin cruiser. The house is now called “The Old Customs House”. The actual office was in the upstairs bedroom to the left of the staircase, which had a desk often covered with blueprints – the plans for boats under construction. The paper-weights used to anchor these were 6” long, cuboid-shaped lumps of lead, covered with pieces of carpet, tied on with coir string, rather rough but effective. I have the weights, still. The kitchen with the old stone sink was used for cleaning brushes. Next to the carpenter’s shop, was a place where timber was steamed, before it was moulded. 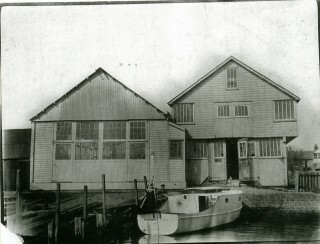 The building shown in the photo of 1909, covering part of the waterfront, had gone by 1934. 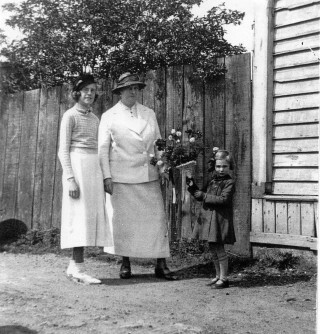 02855 Miss Barbara Husk presents Mrs Kingwell with a bouquet. of His Majesty King George Vth to the throne, dawned fine and sunny. A launching ceremony took place at Husk’s shipyard, of the Myvera III, a 45 foot long motor launch. There were many visitors and onlookers, on the quayside. Myvera III was built by order of Major M. Kingwell for his son, Mr Austin Kingwell. It was the third ship built by the order of the Major within three years. Mrs Kingwell named the ship as she was launched. A bouquet was presented to Mrs Kingwell by me, aged five years, and my mother presented Miss V Kingwell with a dinghy, a gift of the builders. About 1935, Jestyn Philipps, b.1917, whose title later became Lord St Davids, he or his father acquired a barge. This boat was kept at the yard and moored on the side of the wet dock near the Office, and facing the boat sheds. A very young Lord St Davids came from London, at weekends, with a group of young friends, to stay on this vessel, which was his houseboat. The hold had been cleared and painted in turquoise blue and the lined curtains were ecru linen with large, turquoise flowers in Jacobean style. There were compartments with bunks and a galley. In the 1960s there was an article about Lord St David in the magazine ‘Picture Post.’ By then, he was in his mid 50s and lived by the Camden Canal. He had always liked barges and bought a smaller barge, which he called ‘Silver Sail’. He moored the barge at the end of his property, next to the canal. This barge was fitted with an electric engine, the batteries of which were charged when the barge was moored. When it was in use, it glided along the canal noiselessly and caused surprise to watchers on shore. By this time, the noble Lord wore an eye patch and the local boys had a nick-name for him – to do with pirates, which name I forget. I think that he was very kind to the boys and took them out on the water. One day when I was 10 years old, there was a spring tide. The river Colne appeared very wide. My father and I swam across the river and back again, Father pushed a large inner tube, inflated, in case I got into difficulties. I do not remember my father swimming before or since that day. We played on and in the river, sometimes swimming near the Cap Pilar which lay a few hundred yards downstream. This fine ship was owned and sailed by Adrian Seligman, who bought her for £3,000 in about 1937. He advertised for a crew, each member to pay £100 to join the ship, and sail round the world. You can still buy copies of his story. He married before he sailed, and baby Jane was born abroad. See the story of the Cap Pilar. There was always a small dingy moored in the wet dock which we used -without asking. My brother was taught to sail at a young age by Mr Leech. Sometimes he sailed to Brightlingsea, when the tide was right, stayed there all day, had his packed lunch and came home on the evening tide. During the summer months, I used to appropriate a large plank of mahogany, about 18’ long and 2’6”wide, throw it on to the water, and paddle about on it. Afterwards I rescued it, but what the salt water did to the untreated wood I dread to think. There were always barges sailing up to Hythe Quay or to other destinations. They were a splendid sight and manoeuvred in between large tankers and other ships. About 1938, a Naval Lieutenant called Mr Colchester had an 8 or 10 ft. dinghy which was kept at the yard. It was formed of glass fibre and had a carvel built hull – if that is an appropriate description for a moulded sailing boat. It was white, and Bermuda rigged; a very new build at that time, made of Glass Reinforced Plastic, abbreviated to G.R.P. One day, Mr Colchester took Richard, my brother and me for a sail, which happened on a windy day and the waves seemed 3 feet high. It was a very exciting experience for us. We disembarked safely. Mr Colchester or Lieutenant Colchester, was at the yard for overseeing the building of a Naval vessel. All Naval ships had the skipper, lieutenant or captain in attendance, who had to watch the building of their future command, and they learnt how the ship was constructed, so that any problems which developed at sea could be overcome. After the War, Lieutenant Colchester and Father invented a new steering gear. When my father died, my mother and I took this contraption to Mr Colchester at Iken, in Suffolk, where he lived and had retired, still quite young, to the former school house which he had named ‘Troublesome’. I do not know whether he went further with his invention. He was a quiet man who I think had become a recluse. Another visitor was a Dutchman, Cornelius Visser, b. 1903 who came from a long line of well known and talented men – all of that name, going back to the 17th century. He arrived just as the War was beginning, in his elegant, green Dutch barge, of which he had three: first ‘The Sparvum’ then the ‘Emmy’ and finally ‘Minnehaha’. He had sailed from Holland and he came to luncheon at our house that day – very glad for the meal of roast pork, as the voyage from Holland had taken three days and he had not had a proper meal during that time. He returned to Holland and brought his wife, Emmy, who worked for the Red Cross during the conflagration and who lived in Norfolk, with friends. Cor, meanwhile, was appointed official Dutch War Artist and had moved to London. The couple were reunited after the War. In London, Cor painted portraits of all the Dutch Royal Family, Queen Wilhelmina, Queen Juliana and the four Princesses, as well as other officials and members of the Dutch War Cabinet. Cor was also commissioned to do oil paintings of Mrs E. Pretty and her son Robert, of Sutton Hoo. At the time of writing these two paintings are in Tranmer House on the Sutton Hoo estate. In the mid 1960s, Cor taught art during evening class, at Tower Ramparts School, Ipswich and I was fortunate to have drawing lessons with him. He also taught art at Mrs Dickson’s finishing school at Playford. I had met another Dutchman, Takko van Tiyn, in East Africa, in 1961 when Takko was an electrician for the project of the building of the Owen Falls Dam. Takko had a daughter, Afka, at the Dickson’s school. He was present at an open day there, which I attended because my young cousin (who had been at Ashford School, Kent, with Afka,) was also a pupil. I introduced Cor to Takko, and soon they were happily conversing in Dutch. A very pleasant memory. N.B. In Uganda at this time, c.1961, just before that country went independent, there were only two indigenous (African,) qualified electricians. During the War, probably in 1942, Mr and Mrs Denham came to Wivenhoe. Mr Denham was on the staff of Vosper’s, who had acquired the yard for building Naval ships. Vospers had been bombed and their yard was unusable. There were two sons, Lionel and Graham Denham, with whom my brother and I played in the yard. We played ‘Off the Ground’ a game of tag where you had to avoid being caught by whoever was ‘It’, by jumping on to anything solid, standing above the grass. Lionel jumped on to a sky light of the ‘Herbert Gordon’, and broke the glass and cut his leg very badly. We rushed for help, and I am glad to say that Lionel recovered in a few weeks. A tragedy happened one winter, when an apprentice at the yard fell from a dinghy, wearing winter clothes and gum boots. He could not swim and had no life-jacket. He was drowned. He was about 15 years old. Of course, there was no radio, no television, or computers, in Victorian days, nor in the 1920s and 30s, to distract people from thinking for themselves. However we had a telephone both at the Works and also at the house. The number was Wivenhoe 15. Later it became Wivenhoe 315. One lifted the ear piece and the girl at the exchange answered. She took the number that you asked for and connected the two lines. The days and evenings of the Victorians & Edwardians were free from electronic devices, and so the men – and ladies- were free to think, invent and explore new ideas. There were interesting pastimes and ladies did woodwork and they had special, small tools to use especially for woodcarving. All the Husks were inventive and hard working men and women. Great-great grandfather had trained as a blacksmith, but he designed a boat for himself and others saw it sailing, and they asked him to build ships for them. In 1873 the second James Husk built a sloop for himself and named it ‘The Surge’. It was the fastest boat on the Colne, winning many prizes, and other people began to ask for the same design. When Husk’s son (Husk the second,) entered the works, he was clever and innovative. He was interested in plants of all kinds and grafted scions on to different root stock. By the time that the garden where we lived in Anglesea Road had developed to give produce, we gathered excellent apples, especially russets, D’Arcy Spice and juicy Blenheim Orange, Beauty of Bath – an early apple,- and Cox’s Orange. There were chestnut trees, walnuts and almonds; damsons and very large Victoria plums. Cherry plums grew by the house and white heart cherries as well as William pears and dessert pears with red flesh, (blood pears, which I have never seen, before or since), quince and medlars. The grass tennis court was dug up and made into a vegetable garden, when the War began. Wild roses grew round the fences. In the 1930s we kept pigs and chickens, and further down the garden were game birds:- pheasants and partridges, also hares and rabbits. There was plenty of food. Father grew willow trees and I cut down many a tree with him – we used a double handled saw,- and made lengths the right size for manufacturing cricket bats, and split the trunks ready to go to the factory to be made into bats. I was amused by the story of the natural history master, who asked the class ‘What do bats do in the winter?’ One boy piped up, ‘Split, if you don’t oil them!’. Our family left Wivenhoe in 1947 and moved to Suffolk. The boat- building yard was sold to Cooks and my parents retired. That winter of 1947/1948 was very severe, snow began to fall on 3rd January, and lay in places to a depth of five feet. The thaw began on April 7th. The work force at Cooks must have spent a very hard, cold winter, as the buildings had no heating. Everyone wore hats in those days. There was no National Health Service, and no benefits, so one worked – or starved. In the 1980s, I was contacted by James Olney who lived in Finchley. He had a collection of vintage vehicles and also a schooner named the Comus. 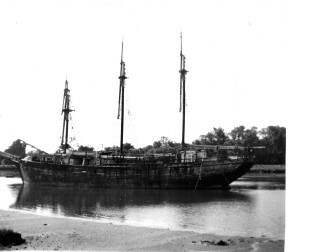 The Comus was a 23.5 ton schooner, 54 feet long, built of wood at Wivenhoe in 1882 by the Husks. This boat was being restored by the Olney family and James asked whether I still had the blueprints of the sail plan – the sails were originally made by Ratsey of Cowes. There were no blueprints extant and the Ratsey yard had been bombed during the War. The Comus was the first ship to have iron floors. Her two masts were only 12 feet apart. She went out to Singapore at least three times, soon after she was launched. She looked very pleasing in recent photographs and was kept at Maldon, Essex. Barbara K. Husk, October 2009. My boat is my vera 11 1934 built by Husk & sons and still going strong. Hi, I recently discovered this page due to researching a boat I own’Calloo’ currently undergoing total restoration at sandwich in Kent. Calloo was built at Husks yard Wivenhoe launched in 1922, she was originally a 42 foot motor vessel and sometime in the late 20’s a ‘canoe’ stern was added as was fashionable with vessels plying the Thames around that time this took her length to 48ft10inches. I wonder if anyone has any originaal plans or photos or any info about Calloo (ssr number 147732. Hello Barbara, I agree with my sister, was a very interesting read. Incidentally, I remember you visiting Shirley and me some years ago in Exeter. We may get up to Wivenhoe sometime this year, would be nice to get in touch. What a marvellous record you have produced, Barbara. Well done and thank you for doing this. It must have taken quite a time to put it all together. Wonderful for family history. I shall put my brother Rod on to the website. He has become quite interested in his Husk forbears. Many thanks, again.